After the success of our Walkie Talkies for O2’s Recycling programme, we had another little think about what else we could make in the name of recycled mobile UpCycling. As wondrous as having a phone embedded at the bottom of your welly really is, we thought that perhaps we might think of something slightly more practical, but something too that would get people talking (if you’ll pardon the pun). And so, with the help of DesignWorks, we created a pair of gloves that double as a phone. The creations we dubbed “Talk to the Hand,” have a speaker unit embedded in the thumb and microphone built into in the little finger. 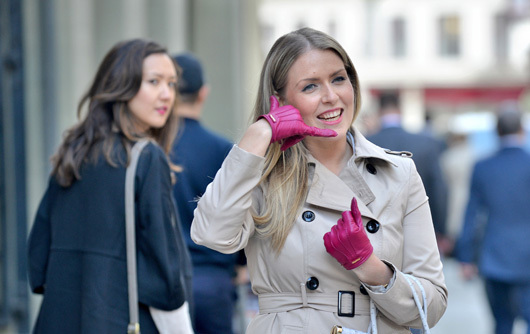 After setting a high precedent in using the likes of Christian Louboutin for the Walkie Talkies, we used vintage Mui Mui and Pineider gloves, combined with handsets that have been recycled through O2. We’re pretty chuffed with the coverage to date, with the story appearing in The Times, The People, The Daily Mail, Pocket-lint, Digital Spy, MSN, Design Taxi, The Gadget Show to name a few. In fact, there have been over 120 pieces from around the world on our creation. Final mention has to go to BBC Tech Online who interviewed our designer Sean Miles, with the video reaching the top spot for most viewed video on the BBC News home page. Go one, give the team a hand (sorry).